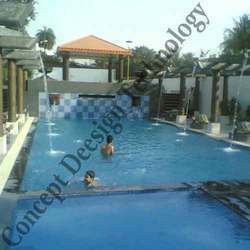 We are a leading Manufacturer of spa pools, pool in resorts, swimming pool with water sheet and terrace pools from New Delhi, India. This minimalist design pool perfectly complements the contemporary interior of this newly rebuilt chelsea residence. The overall emphasis has been on light, with natural daylight entering from atria on both ends of the pool and specialist halogen lighting through out the area, including the effect of mirrors, to the extent that this underground space does not feel subterranean whatsoever. The inside of the pool has been made interesting with the creation of various levels and the whole area comes alive with the contrasting textures of large white porcelain tiles, teak wood and the dry bonded black slate wall. Going to the swimming pool is probably what many of us living in anywhere would like to do several times a week. Swimming has always been a favorite exercise for fitness freaks as it is the best form of relaxation which generally energizes our body and helps us unwind. Swimming smoothly nourishes every muscle of our body and relieves you of fatigue and pain. 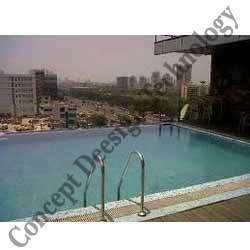 You would find most of the hotels, health clubs, fitness centers and private clubs in Gurgaon have public pools which are used mostly for exercise and relaxation. Frankly speaking no one would say no to an hour of splash and dive in the vast pool of water. But one must be cautious about the cleanliness and hygiene of the pool water. This residential swimming pool with a moving floor set in an an arched wood finished enclosure has attracted a great deal of industry interest. 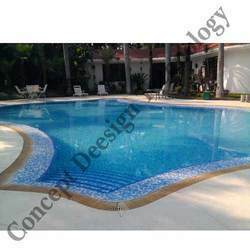 The exclusive installation functions both as a large leisure pool with adjustable depth accommodating for children of different heights and swimming abilities as well as a concert hall when the floor is raised. The innovative technology allows a pool area to double up as a dance floor/hall, cinema, party/meeting/conference facility, terrace. The possibilities are endless, of particular interest if space is limited. 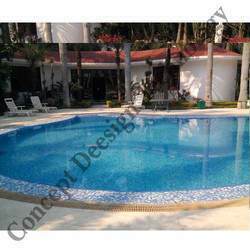 Looking for Swimming Pool Manufacturer ?